A versatile and attention-grabbing display tool for any indoor or outdoor event, this fiberglass teardrop flag is lightweight, collapsible and can be assembled in minutes. With a range of base options to suit a wide variety of promotional environments, the custom printed flag adds movement and interest to any display. 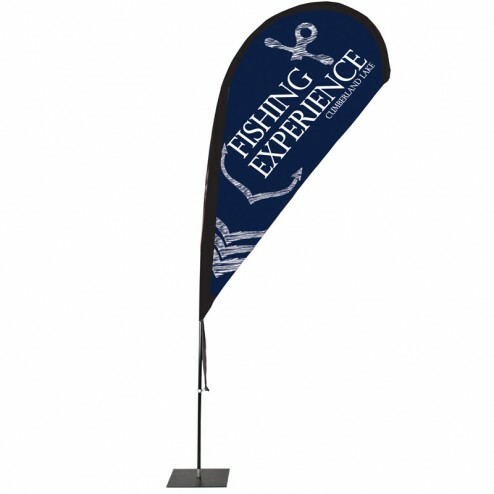 Available in a range of heights from 2.8m up to an impressive 5.6m, the flags have a durable fiberglass pole and 110gsm flag knit custom printed with your corporate branding or promotional messaging. 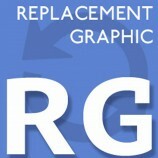 The single sided graphic is produced in full colour to ensure colours are bright and vibrant whilst text is crisp, clean and easy to read, even from a distance. 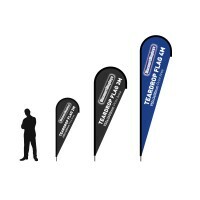 A great choice for use on exhibition, trade show and expo stands, the flag banners are also ideal for use at outdoor events, festivals, on garage forecourts and outside retail or business premises as the fabric is weather resistant and the fibreglass flag is tested as suitable for wind speeds up to 18mph. 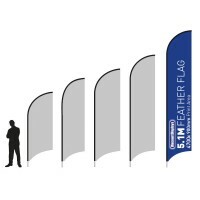 The bespoke flags come with a range of base options to suit both internal and external anchoring requirements. 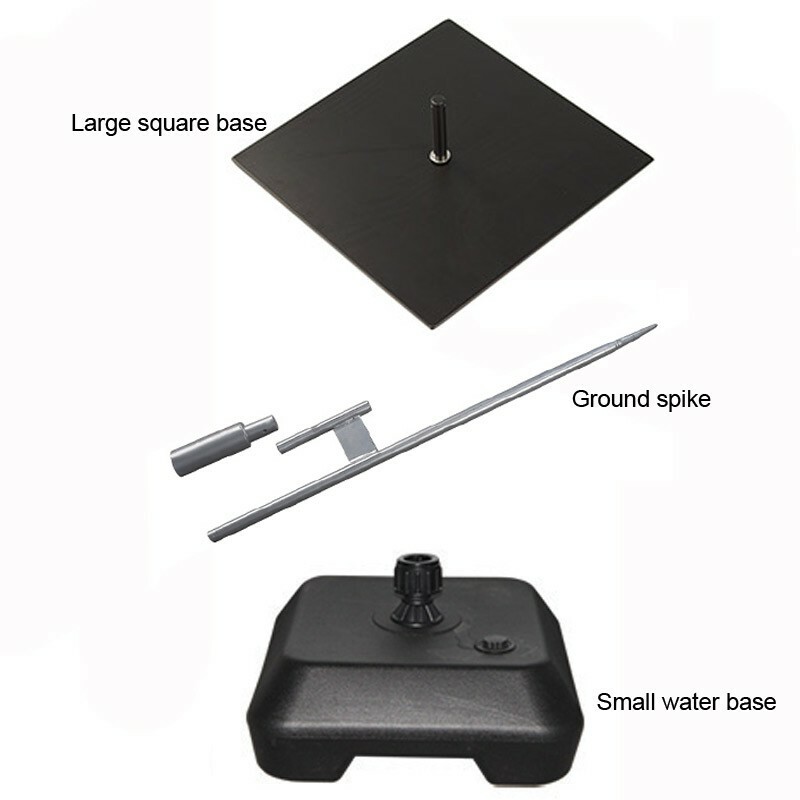 Choose between a simple ground spike or heavy duty screw stake suitable for ground or grass, a car foot base or one of our weighted or fillable stands designed to stabilise and weigh your flag down in the UK weather, securing it safely in position. Quick and easy to assemble and collapse down without tools or expertise, the multi-section fibreglass pole folds for easy transportation and storage. The flag fabric is washable at low temperatures meaning your branding will always look pristine, wherever it is being displayed. 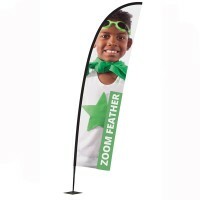 Recommended for larger flag sizes, the ideal way to ensure your flag stays where you need it. 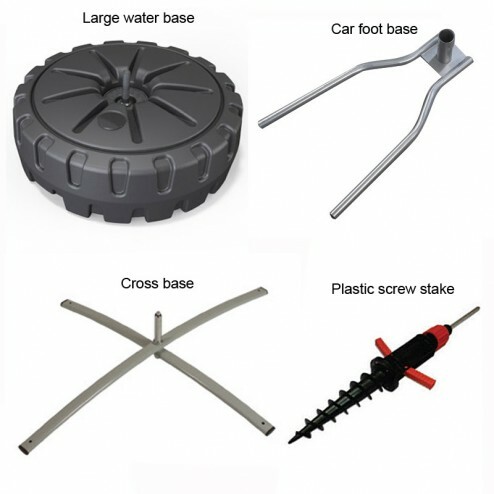 Hardware dimensions: 330 mm x 565 mm - Ideal for use on garage forecourts or promotional displays. Large Square Base with weighting ring: 11.78kg + 6kg (when filled) - a premium finish at a budget price. The ultimate hard ground solution. Ground Spike: A stylish way to keep your flags stable at outdoor events.